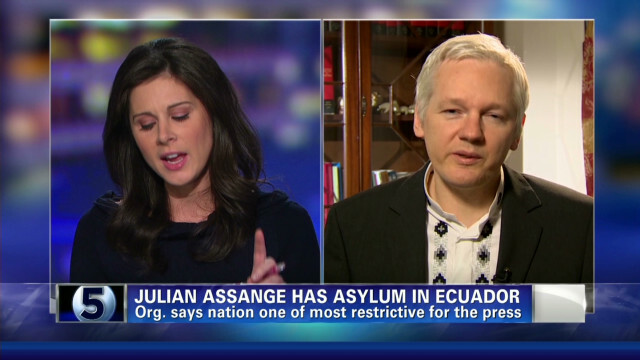 Assange is one of the world’s most controversial people. The 41 year-old Australian has posted hundreds of thousands of U.S. military documents, videos and diplomatic cables on his website, and the U.S. government is still scrambling to find out where he got them. The government believes his source is Army private Bradley Manning, who stands accused of stealing classified documents in 2010 and giving them to WikiLeaks. The former intelligence analyst in Iraq is facing 22 charges, including aiding the enemy which carries a life sentence. Assange won’t reveal his sources and has not been charged in this country, but for the past five months he’s been living in the Ecuadorian embassy in London after Ecuador granted him amnesty. He’s seeking protection from extradition to Sweden, where he faces allegations of sexual assault – allegations that he denies.